The project is located at Desa Sirnaresmi, Gunungguruh, Sukabumi, Jawa Barat, Indonesia. 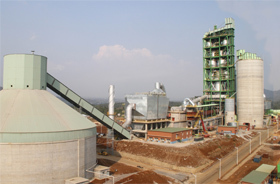 Sinoma (Suzhou) Construction Co., Ltd. as the General Contractor for the construction of Indonesia SJW 5000t/d Cement Production Line gained trust and praise from the Owner Thailand SCG Group. The production line was successfully ignited on September 2, 2015.